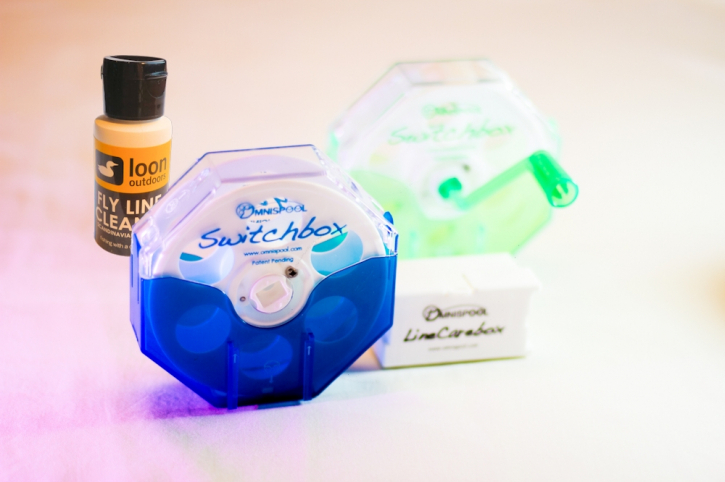 Easy to use, convenient, and good value for money – The system for storing, switching, and cleaning fly lines by OmniSpool: Switchbox, Line-Carebox, crank handle + fly line cleaner by Loon. Most likely, you own more than one fly line. Do you buy for each line a spare spool for your fly reel? Do you store the lines on the original spools? Switching lines at the water is no fun, but with the line management from OmniSpool it is. With the system from OmniSpool you will have them in good working order, protected and it saves you from buying extra fly reel spools. For storing and travelling, you can clip Switchboxes together and label them. To change a line you can easily take the spool out of the box and clip it to the outside of the Switchbox. Insert the crank handle into the spool, jam the Switchbox between your feet and start loading or unloading your reel. You do not need a third hand. The Line-Carebox maintains your fly line with four felt pads. The front pads clean, the rear ones coat. With the basic layout, you receive the fly line cleaner from Loon. Place the line into the Line-Carebox and clip it to the Switchbox. Again, you do not need more than two hands to keep your lines easily in top condition.